I'm continuing to share my progress with Pat Sloan's weekly mystery quilt, Grandma's Kitchen. This week's block is called Sticky Buns. 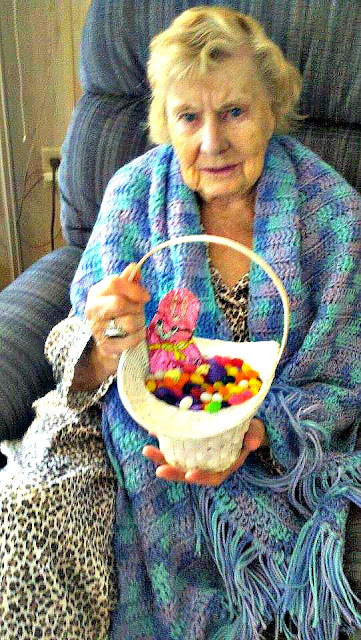 Pat was inspired by a favorite treat her grandma made. I didn't spend a lot of mornings with Gramma Ann because she lived three hours away when I was growing up and at least 3 states away when I was an adult. Still, warm rolls for breakfast reminds me of sleeping in and a lazy breakfast in pajamas. Maybe because when I visited Gramma, it was usually a holiday or vacation when we had time for leisurely meals. Gramma loved leopard print. In her 91 years she had more than a few leopard print nighties and PJs. For this block, I used one of Gramma's leopard skin shirts as the main print. The coordinating print has a filigree pattern, which is very feminine, like my Gramma, a former Avon lady who was quite a knockout in her day. My aunt sent me this picture of Gramma with more leopard skin attire. She even had a leopard skin cane in her final years! I asked my aunt why Gramma liked leopard so much and she said, "I don't know. Maybe because Grampa did." Va va voom, Gramma! Great block and how wonderful to incorporate fabric from your Gramma. Your Gramma's vitality shines in this blog. I love reading the stories of your Grandma, and seeing how you are putting so much of her spirit in your blocks. This will be a special quilt! Glad I found your blog via "SewCanShe"
Another great tribute to Grandma block! Thanks for sharing!